The first time I heard about Mansa Musa, I was an undergraduate student. At Georgia State University, I “double majored” in journalism and anthropology. In my anthropology classes, I learned about Margaret Mead, cultural relativism, honor killings, Native American two-spirit ideology, australopithecines and…Mansa Musa. Mansa [Mandinka/ Malinke word for king] Musa [Arabic form of Moses], also known as Kankan Musa, ruled the legendary Malian empire (the world’s largest empire in the world at the time; the famed Timbuktu was part of the Malian empire) founded by the celebrated Lion King Sundiata (also spelled Sunjata) from the early 1300s until he died around 1337. Musa adopted Islam, which at the time was becoming the religion of the ruling elite throughout the region referred to by historians as Western Sudan. His 1324 pilgrimage to Mecca is historic. Apparently, Musa astounded witnesses who watched his 60,000 person caravan journey from Mali throughout north Africa to Cairo and onto Mecca. Historians recorded that Musa’s 12,000 slaves were draped in Persian silks and brocade. 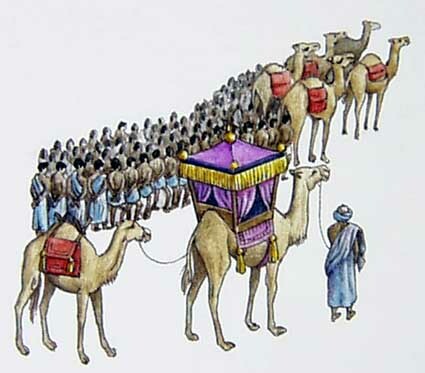 Musa arrive to Mecca with 300 pounds of gold, carried by 18 camels. 14th century Arab historian Al-Umari (or Al-Omari) visited Cairo about 12 years after Mansa Musa’s visit and he documented that Cairo residents still remembered the lavish splendor of Mansa Musa. Basically, this brotha was rich! But I had no idea how rich he was compared to today’s billionaires. A new study revealed that Mansa Musa is the richest person ever. The study claims the emperor was worth $400 billion USD, the figure has been inflation-adjusted. The Malian empire traded slaves, beads, spices and other goods but it was salt and gold that made Musa rich the richest person…ever! ← No African Leader Worthy Enough? Stunning and wonderful stuff worth reading.